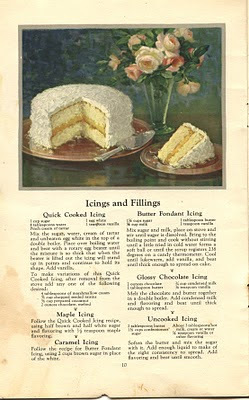 From that 1936 Airy Fairy booklet, recipes for icings and fillings for your cakes. The recipes (and variations) are for Quick Cooked Icing, Maple Icing, Carmel Icing, Butter Fondant Icing, Glossy Chocolate Icing, and Uncooked Icing. These all sound SO good. Thanks for sharing!